Recorded on this day in 1984 in support of the famous Talking Heads film and record, Stop Making Sense, David Byrne was interviewed for 40 minutes on the radio about all things Talking Heads. However, there was one dynamic that set this chat apart—Byrne provided the questions. Perhaps facetiously, Byrne claimed that he previously conducted the interview on video by himself and though the radio interviewer Lisa Robinson was definitely thrown for a loop, she engages in a thought-provoking discussion, showcasing his sharp wit, wide-ranging artistic vision and lack of ego. Byrne discusses his band’s music videos, the New York City punk scene, his famous “big suit” and their ascent from cult band to a group that successfully infiltrated pop culture. 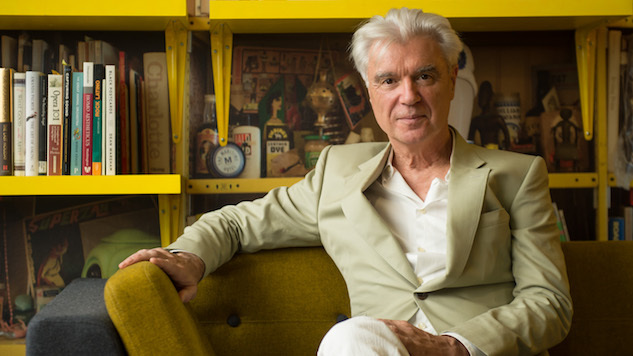 David Byrne talks about the recent records he bought—from African records to Tex-Mex to Frankie Goes to Hollywood—and he also discusses why Talking Heads seemed to be one of few bands from the CBGBs scene to flourish long after that venue’s historical peak. Robinson and Byrne spend a decent chunk of time talking about the making of the Stop Making Sense film, and since Byrne was involved in nearly every aspect of the movie, he provides crucial insight, making this a must-listen for Talking Heads fans. They also discuss Byrne’s upcoming movie, 1986’s True Stories, which was still in its very early stages at this point. Listen to Byrne’s full interview below, recorded on this day in 1984.